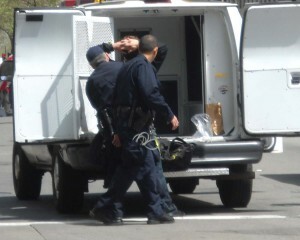 Police prepare demonstrator for arrest. 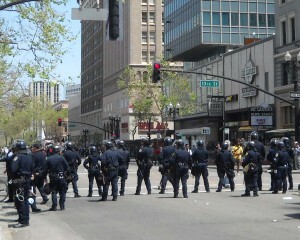 Police in riot gear cordon off Broadway in Oakland, Tuesday morning, after first arrests were made. 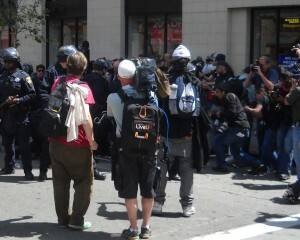 The Noon May Day rally at Frank Ogawa Plaza in Oakland CA was marred by a scuffle between Police and Demonstrators. Specific details were lacking in the initial news reports on Bay Area media. The World’s Laziest Journalist will include more details in Friday’s Week in Review Column.